Sings.... "I'm so excited and I just can't hide it... la la la la la...la la la la la la" Do you ever find something in your stash that you put away cos you didn't think it would be up to much... even though you bought it in the first place???. 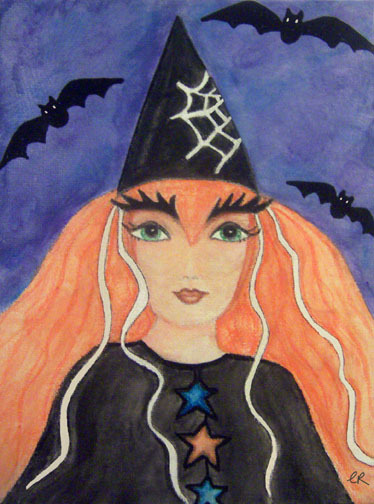 Well I wanted to take part in the Willowing Halloween challenge and was looking for something to paint with when I came across some cheap as chips watercolour pencils from Tesco in my stash... I only bought them cos I wanted to alter the box...lol...but I decided to have a go with them and whoooohooopetty whooo I bloomin'love them!! They are fab. A box of 12 recycled water colour pencils for about 4 quid (I think that's what I paid) and the colours are lovely. This is beautiful Chris. You should teach!